Japanese Circa 1900 basket by Chikuyusai. 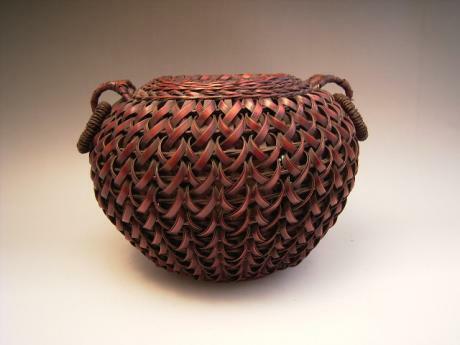 The basket is woven in the shape of a Chinese vessel with handle. Comes with TOMOBAKO, original artist signed wooden storage box. On the box is written "Copy of Chinese Item. 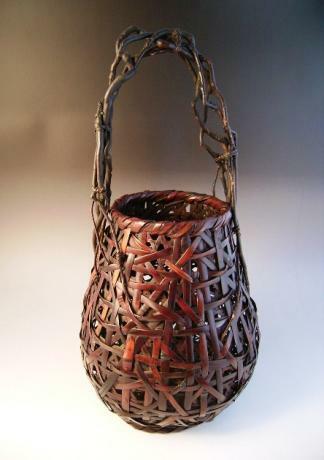 Hexagonally shaped basket with handle. Chikuyusai with Chikuyusai stamp." T.. 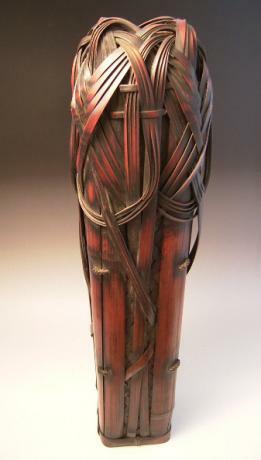 Mid 20th Century Japanese Bamboo Flower Basket. Signed by artist, HASHIMOTO SUSUMU. 30" tall by 14" wide. 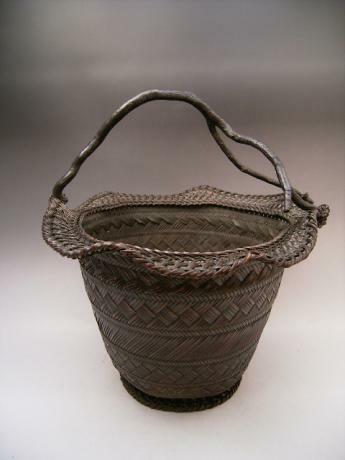 Japanese mid 20th century bamboo basket. Beautifully woven in an opened pattern incorporating the fine wisteria branches that create the handle. Unsigned. The basket measures 18" tall by 9" in diameter at its widest. 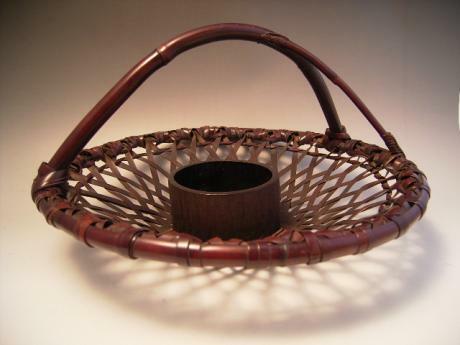 Japanese early 20th century bamboo basket. 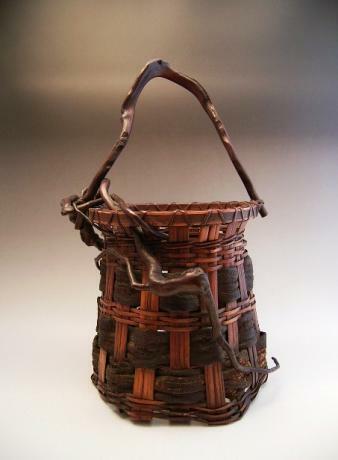 The basket is of tall and narrow form with beautiful naturally formed wisteria branch handle. Unsigned. The basket measures 20" tall by 8" in diameter at top and 5 1/2" in diameter at bottom. 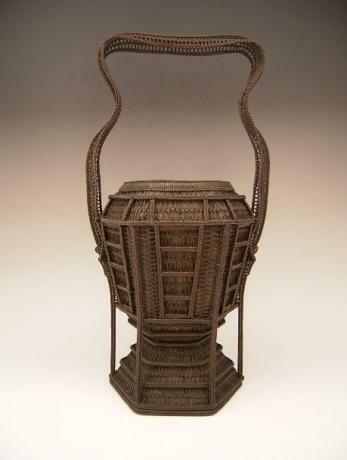 Japanese 19th century bamboo flower basket by master basket maker, WADA WAICHISAI. WADA WAICHISAI was born in 1815 and lived until 1901. The basket is of low circular form with natural bamboo handle and top round frame. The rest of the basket is loosely woven with medium sized strips of bamboo. ..
Japanese early 20th century bamboo flower basket. 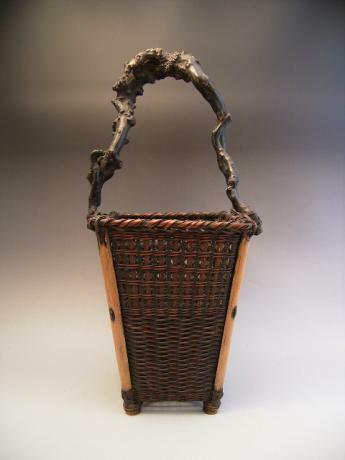 The basket is of low round form with 2 side handles. 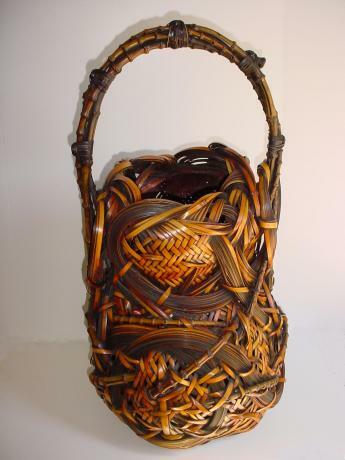 The basket is woven with thin and medium wide strips of dark bamboo. Comes with metal lined bamboo water holder. 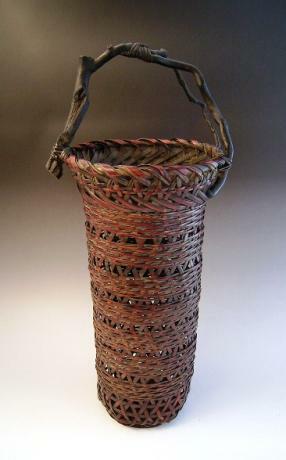 The basket measures 8" tall , 11" wide and 10" deep. The base of the basket i..